The problem with the prophetic proclamations about the rise of social media and its impending dominance? It’s that we can focus too much on the ‘media’ part of ‘social media’, instead of the ‘social’ aspect, according to the authors of ‘The Face-to-Face Book“. But it’s true that social media has taken the world by storm. More importantly, many companies – big and small – have taken to Facebook, Twitter and many other social media platforms to leverage on people’s social nature. Many have eschewed traditional forms of marketing and advertising to pursue this pot of gold – and ‘The Face-to-Face Book” authors Ed Keller and Brad Fay point out that this can be to their detriment. Keller and Fay use exclusive data mined from Keller Fay Group‘s – of which they are its CEO and COO, respectively – TalkTrack online and offline word-of-mouth measurement tool that shows that 90-percent of influential conversation actually takes place in the real world and not on online social networks. That’s right – that’s 90 percent of word-of-mouth is happening in coffee shops, over the dinner table, at the retail stores, and not on Facebook or Twitter. Oh dear… doesn’t that fly in the face of what we’ve been hearing at all those social media conferences? There’s data, for example, to show word-of-mouth is far likelier to lead to purchase intent when the influencer is standing right next to you at the store, and that traditional media actually plays a huge role in conversion. And Keller and Fay should know. After all Ed Keller is a past president of the Word of Mouth Marketing Association and also the Market Research Council – he also wrote the book “The Influentials” – while Brad Fay won the Grand Innovation Award of the Advertising Research Foundation for the development of TalkTrack. In fact, Keller and Fay’s point is that, in an age where marketing dollars is beginning to swing in the direction of online advertising and social media marketing, marketers still need to have a very balanced marketing mix. ‘The Face-to-Face Book” shows very specific examples to demonstrate that small businesses without a huge marketing largesse can create online and offline word-of-mouth, and the need to think of social media as just one part of a brand’s overall outreach to existing, new and potential customers. 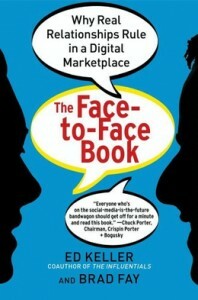 ‘The Face-to-Face Book” is a cautionary tale of rushing to find that pot of gold at the end of the social media rainbow. The data Keller and Fay show is illuminating, and we should take social media as what it is – just another communications channel to reach our intended audience. Nothing less, nothing more.